1. National Cancer Institute SEER program. Cancer stat facts: female breast cancer. http://seer.cancer.gov/statfacts/html/breast.html. Accessed June 15, 2017. 2. American Cancer Society. Hormone therapy for breast cancer. Revised August 18, 2016. www.cancer.org/cancer/breastcancer/detailedguide/breast-cancer-treating-hormone-therapy. Accessed June 15, 2017. 3. Inman S. Three experts examine the ER-positive treatment landscape. OncLive. February 26, 2015. www.onclive.com/conference-coverage/mbcc-2015/three-experts-examine-the-er-positive-treatment-landscape. Accessed June 23, 2017. 4. US Food and Drug Administration. FDA approves Ibrance for postmenopausal women with advanced breast cancer. Press release. February 3, 2015. www.fda.gov/newsevents/newsroom/pressannouncements/ucm432871.htm. Accessed June 23, 2017. 5. Ibrance (palbociclib) capsules [prescribing information]. New York, NY: Pfizer; March 2017. 6. US Food and Drug Administration. Ribociclib (Kisqali). March 13, 2017. www.fda.gov/drugs/informationondrugs/approveddrugs/ucm546438.htm. Accessed June 15, 2017. 7. Kisqali (ribociclib) tablets [prescribing information]. East Hanover, NJ: Novartis; March 2017. 8. Toich L. Kisqali Femara co-packaging approved for breast cancer treatment. Pharmacy Times. May 9, 2017. www.pharmacytimes.com/news/kisqali-femara-copackaging-approved-for-breast-cancer-treatment. Accessed June 23, 2017. 9. Hortobagyi GN, Stemmer SM, Burris HA, et al. 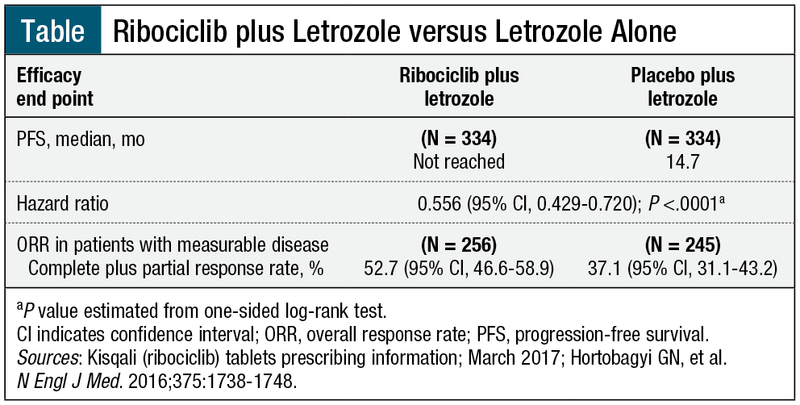 Ribociclib as first-line therapy for HR-positive, advanced breast cancer. N Engl J Med. 2016;375:1738-1748.